This article is about the author and book editor. For other uses, see John Hawkesworth (disambiguation). John Hawkesworth (c. 1715 – 16 November 1773), English writer and book editor, was born in London. He is said to have been clerk to an attorney, and was certainly self-educated. In 1744, he succeeded Samuel Johnson as compiler of the parliamentary debates for the Gentleman's Magazine, and from 1741 to 1749 he contributed poems signed Greville, or H Greville, to that journal. In company with Johnson and others he started a periodical called The Adventurer, which ran to 140 issues, of which 70 were from the pen of Hawkesworth himself. On account of what was regarded as his powerful defence of morality and religion, Hawkesworth was rewarded by the archbishop of Canterbury with the degree of LL.D, In 1754–1755 he published an edition (12 vols) of Swift's works, with a life prefixed which Johnson praised in his Lives of the Poets. A larger edition (27 vols) appeared in 1766–1779. He adapted Dryden's Amphitryon for the Drury Lane stage in 1756, and Southerne's Oronooko in 1759. He wrote the libretto of an oratorio Zimri in 1760, and the next year Edgar and Emmeline: a Fairy Tale was produced at Drury Lane. His Almoran and Hamet (1761) was first drafted as a play, and a tragedy based on it by S J Pratt, The Fair Circassian (1781), met with some success. 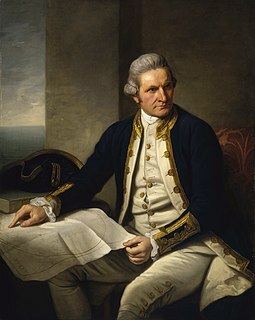 He was commissioned by the Admiralty to edit Captain James Cook's papers relative to his first voyage. For this work, An Account of the Voyages undertaken ... for making discoveries in the Southern Hemisphere and performed by Commodore Byrone John Byron, Captain Wallis, Captain Carteret and Captain Cook (from 1702 to 1771) drawn up from the Journals ... (3 vols, 1773) Hawkesworth is said to have received from the publishers the sum of £6000. His descriptions of the manners and customs of the South Seas were, however, regarded by many critics as inexact and hurtful to the interests of morality, and the severity of their strictures is said to have hastened his death. He was buried in the parish church at Bromley, Kent, where he and his wife had kept a school. Hawkesworth was a close imitator of Johnson both in style and thought, and was at one time on very friendly terms with him. 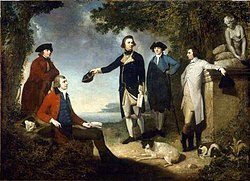 It is said that he presumed on his success, and lost Johnson's friendship as early as 1756. ^ a b c This article incorporates text from a publication now in the public domain: Chisholm, Hugh, ed. (1911). "Hawkesworth, John" . Encyclopædia Britannica. 13 (11th ed.). Cambridge University Press. pp. 97–98. ^ Hawkesworth, John. "An Account of the Voyages Undertaken by the Order of His Present Majesty, For Making Discoveries in the Southern Hemisphere. Vol. I." Charting the Land on the Ocean Pacific Exploration, 1520–1876. University of Otago. Retrieved 3 June 2015. ^ Truss, Lynne (14 January 2017). "Point of view: 'The case of John Hawkesworth proves that a bad review can kill you'". The Guardian (Review section). London. p. 15. Retrieved 17 January 2017. John L. Abbott (1970). "John Hawkesworth: Friend of Samuel Johnson and Editor of Captain Cook's Voyages and of the Gentleman's Magazine". Eighteenth-Century Studies. 3 (3): 339–350. doi:10.2307/2737875. Wikimedia Commons has media related to John Hawkesworth. Vice-Admiral John Byron was a British Royal Navy officer and politician. He was known as Foulweather Jack because of his frequent encounters with bad weather at sea. As a midshipman, he sailed in the squadron under George Anson on his voyage around the world, though Byron made it only to southern Chile, where his ship was wrecked. He returned to England with the captain of HMS Wager. He was governor of Newfoundland following Hugh Palliser, who left in 1768. He circumnavigated the world as a commodore with his own squadron in 1764-1766. He fought in battles in the Seven Years' War and the American Revolution. He rose to Vice Admiral of the White before his death in 1786. Wallis is a Polynesian island in the Pacific Ocean belonging to the French overseas collectivity of Wallis and Futuna. It lies north of Tonga, northeast of Fiji, east-northeast of the Hoorn Islands, east of Fiji's Rotuma, southeast of Tuvalu, southwest of Tokelau and west of Samoa. Its area is almost 100 km2 (39 sq mi) with almost 11,000 people. Its capital is Matāʻutu. Roman Catholicism is the predominant religion. Its highest point is Mount Lulu Fakahega. Wallis is of volcanic origin with fertile soil and some remaining lakes. Rainfall is plentiful. This Horrid Practice: The Myth and Reality of Traditional Maori Cannibalism is a 2008 non-fiction book by New Zealand historian Paul Moon. The book is a comprehensive survey of the history of human cannibalism among the Māori of New Zealand. It was the first published academic survey of Māori cannibalism. The Tahitian Dog is an extinct breed of dog from Tahiti and the Society Islands. Similar to other strains of Polynesian dogs, it was introduced to the Society Islands and Tahiti by the ancestors of the Tahitian (Mā’ohi) people during their migrations to Polynesia. They were an essential part of traditional Tahitian society; their meat was included in Tahitian cuisine and other parts of the dog were used to make tools and ornamental clothing. Dogs were fed a vegetarian diet and served during feasts as a delicacy. European explorers were the first outsiders to observe and record their existence, and they were served to early explorers including Captain James Cook. The Tahitian Dog disappeared as a distinct breed after the introduction of foreign European dogs.